Clearly, your horse’s way of going will be influenced heavily by the way that you ride him. 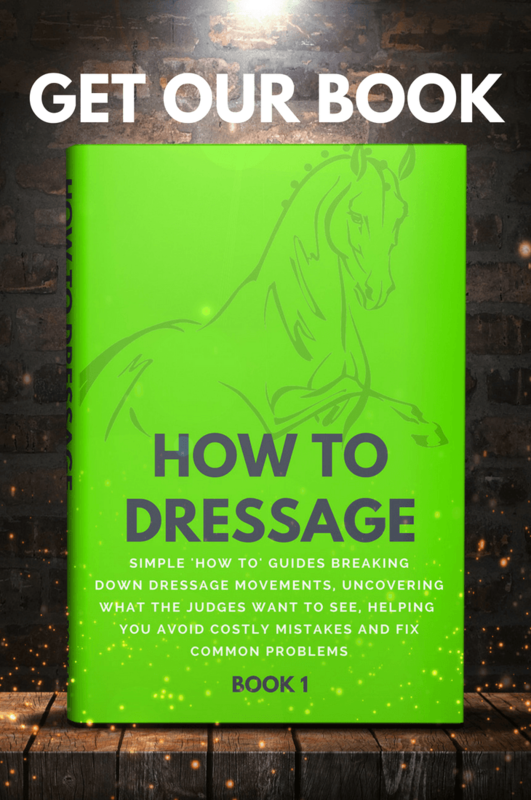 This article looks at the dressage rider’s position and examines how it can influence the horse. In order to maximize your horse’s performance, it is extremely important that you are both in balance. 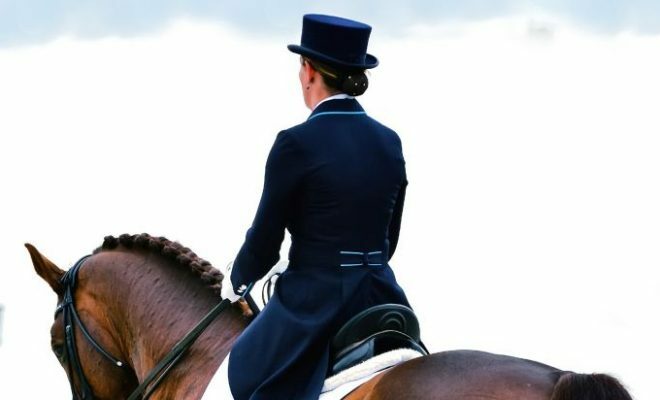 The most effective way to achieve this is by adopting a correct riding position that allows you to give aids lightly, but efficiently, without hindering the horse’s movement, or losing your balance. If the rider’s position is not correct, the aids can be misinterpreted by the horse. It’s not solely a matter of ‘sitting pretty’ on a horse but knowing what to do with your body to allow the horse to do his job properly. If you have access to mirrors or have a friend with a camera, take a look at where you are sitting. Your seat is fundamental to your balance and security. You should be sitting into the center of the saddle with both seat bones having even weight dispersal, and your tailbone should be pointing down centrally to form a three-point seat. Be careful not to tip forwards onto your fork. Your hips should be upright. If you tip your hips too far back, you’ll end up sitting as though you were reclining in an armchair. This position will place too much weight over the horse’s loin area and will place your balance ‘behind the movement’. If you sit with your hips too far forward, your shoulders and weight will follow suit. 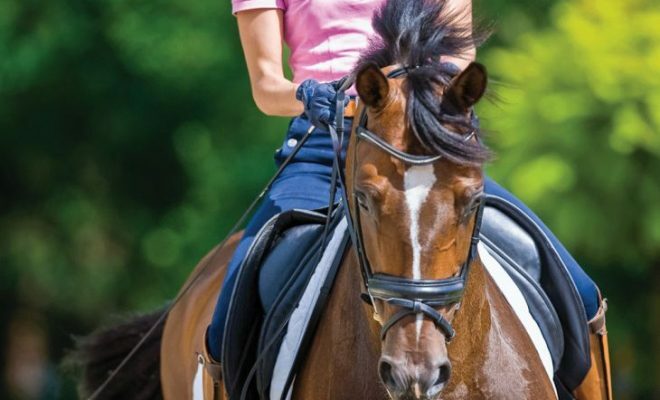 You’ll end up gripping with your knees, which in turn will take your lower leg away from your horse’s sides. Ultimately, your horse will lose his balance onto his forehand as he attempts to compensate for your instability. From the side, you should see a straight line running from your shoulder, through your hip to your heel. 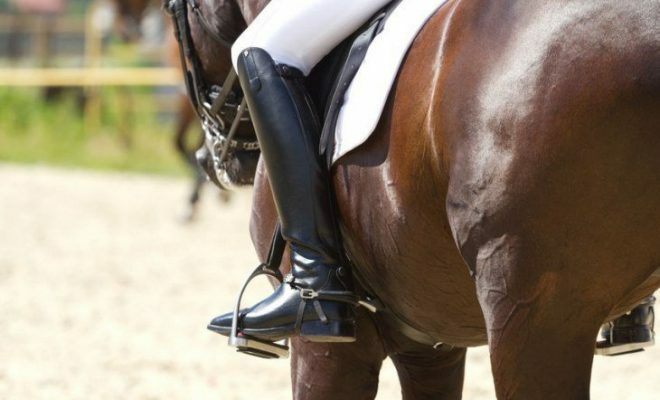 Your leg should hang down just behind the horse’s girth. Your knee should be relaxed and your inner thigh should rest lightly on the saddle, without gripping. 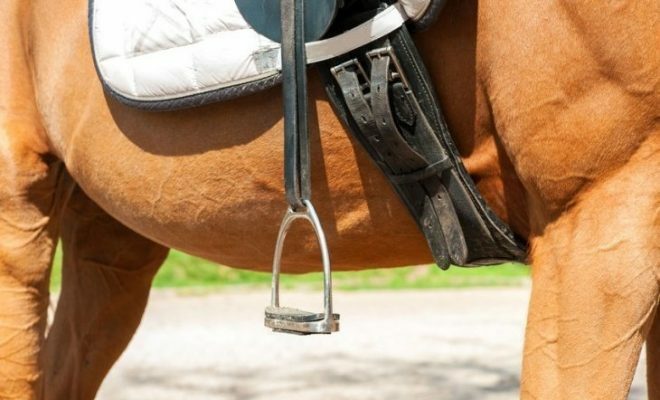 Your weight should run down into your heel, with the stirrup iron sitting on the ball of your foot and your ankle joint soft and mobile, in order to absorb the horse’s movement. Your back should be straight and slightly hollowed in order to allow you to follow the horse’s movement. Use your core muscles to maintain an upright posture and to control the amount of movement through your hips. Your hands should be carried as a pair, out in front of you, just above and in front of the pommel of your saddle. There should be a straight line from the bit through to your elbow, and your upper arms should hang quietly by your sides, without tension or stiffness. Keep your hands as a fist with your thumbs on top. Keep your head up. Don’t look down; as this will cause your upper body to incline forwards, placing more weight on your horse’s forehand. The more correct your position is, the more effective you will be as a rider. 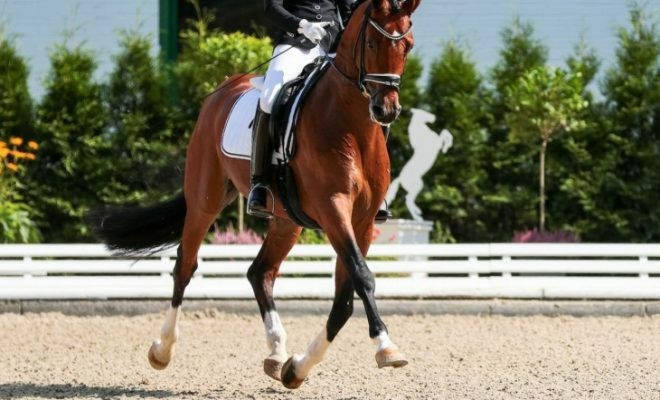 Time spent working on your position will undoubtedly improve your horse’s way of going, and will also gain you a higher collective mark on your dressage score sheet. 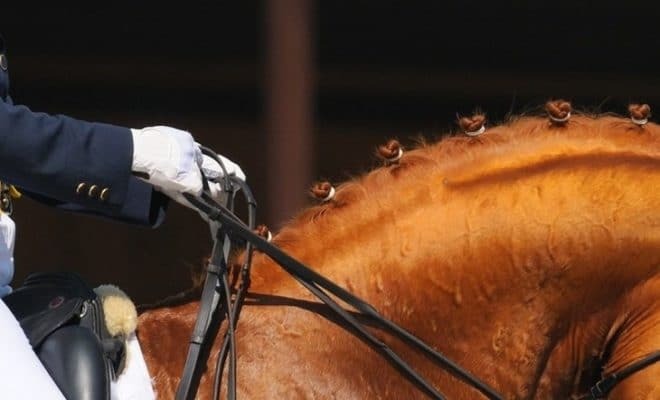 How Long Should Your Reins Be?